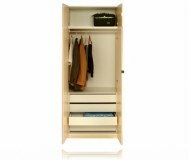 Basics 514 wardrobe was appropriately designed for small room that require additional storage space but unable to fit 2 full-size closets. 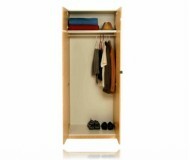 Behind it single door (Left-hinged), is a shelf with hang rod suitable for hanging long coats and dresses. 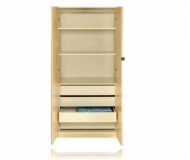 The Bottom can also be used as an additional self for storing of shoes and other bedroom accessories. By placing addition units side by side for seamless integration you can create virtually unlimited customize interior configurations to store every items in your bedroom that need storing. With your choice of case finishes, it's easy to match this wardrobe armoire with any dacor.